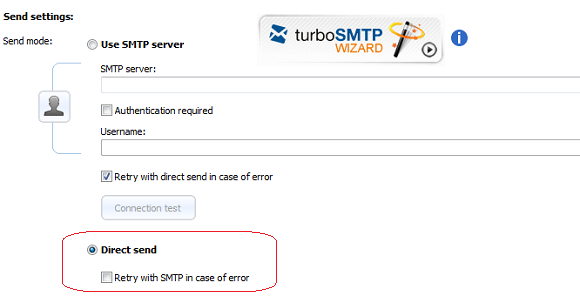 The main advantage of Direct Send is that if you don’t have a reliable SMTP server you can bypass this issue; also, if you rely only on a normal free provider like Gmail or Hotmail, you cannot send more than a certain number of messages per day or per hour – while with Direct Send this problem is avoided. However, it’s advisable to use it only if your domain has an excellent reputation (better with a DKIM certification) and you rely on a static IP: otherwise the receiving server would probably take your communication as spam. The downsides, anyway, are considerable and must not be underestimated. First of all, it’s not as reliable as a good SMTP server: when you send a bulk email your mail client must contact directly a lot of different servers, and it’s simply not structured to handle the whole process. Second, it’s generally much slower, as your computer is clearly “farther” from the recipients’ one than an outgoing server. That’s why, if you need to send a mass email, our advice is to choose a professional SMTP service like turboSMTP. For one simple reason: it’s designed right to do this job – deliver your email in the safest and quickest way, dealing with possible antispam filters, managing email queues, and also helping you analyze hard bounces with its improved statistics panel.